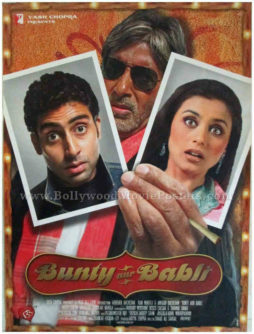 Old Amitabh movie poster of the hit Hindi film Bunty Aur Babli (2005) for sale. This is an actual surviving Amitabh Bachchan poster of the 2005 Hindi movie that was based along the lines of the great American classic, Bonnie and Clyde. Bunty Aur Babli was the first film to feature Amitabh Bachchan and his son Abhishek Bachchan together, making this poster highly collectible! Printed and circulated during the original first release of the film (somewhere in the 2000s), this matt Bunty Aur Babli poster was originally designed for publicity of the film but never ended up being used. Superstar Amitabh Bachchan is seen holding two wanted photographs of Abhishek Bachchan and Rani Mukerji in this Bollywood movie poster. One of the songs from the film, “Kajra Re” featuring Amitabh Bachchan, Abhishek Bachchan along with a stunning guest appearance by Aishwarya Rai became a rage throughout the nation. Penned by master lyricist Gulzar and sung by Alisha Chinoy and Shankar Mahadevan, the song is fondly remembered and played till today. Reissue Bollywood movie poster of the epic Hindi film Sholay (1975) for sale. Featured here for sale is a reissue Sholay film poster circulated during a very recent screening of the greatest film ever made in Indian cinema. Printed and circulated very recently, this Sholay film poster was originally designed for publicity of a recent re-release of the film but never ended up being used. Sholay has an unbeaten record for running for over five consecutive years after being released. The film enjoys a cult following in India and its dialogues are often quoted in various media. It is widely believed that Sholay is the highest grossing Indian film of all time when adjusted for inflation, making this Sholay film poster highly collectible! Yeh Dosti (This Friendship) was one of the most popular songs from the epic Bollywood movie Sholay. This Sholay movie poster features a photo still from the song. 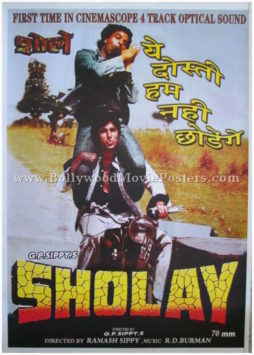 Amitabh Bachchan & Dharmendra who play the characters of Jai and Veeru respectively, are seen riding on the iconic Sholay sidecar motor bike in this Bollywood movie poster. Sholay is the highest grossing film of all time in Indian cinema and unanimously regarded as the greatest film ever made in Bollywood. Declared as the “Film of the Millennium” by BBC India in 1999, Sholay is an unforgettable classic that has become almost synonymous with ‘masala’ in Indian cinema. Its characters such as Jai, Veeru, Basanti, Thakur & Gabbar Singh have been etched into history. Sholay holds a record of 60 golden jubilees across India, and was the first film in India to celebrate a silver jubilee at over 100 theaters. Sholay was the longest running film in Indian cinema until Dilwale Dulhania Le Jayenge (1995) broke its record of 286 weeks in 2001. In January 2014 a 3D version of Sholay was released. The soundtrack of the film composed by R. D. Burman became a stellar success. Songs such as “Yeh Dosti” and “Mehbooba Mehbooba” are fondly remembered and played till today. 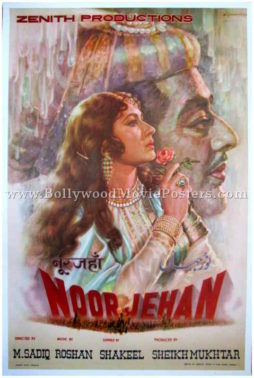 Reissue Bollywood poster of the historical Hindi film, Noor Jehan (1967) for sale. Featured here for sale is a reissue Bollywood movie poster circulated during a very recent screening of the old Hindi film Noor Jehan (1967). Printed and circulated very recently, this Bollywood poster was originally designed for publicity of a recent re-release of the film but never ended up being used. Noor Jehan featured Meena Kumari in the lead role. Popularly known as the “Tragedy Queen of Bollywood,” Meena Kumari starred in over 90 films in her career that spanned three decades and is often remembered as the Cinderella of Indian cinema. This Bollywood poster for sale features a stunning hand painted rendition of Meena Kumari holding a rose. A large hand panted side profile of actor Pradeep Kumar is seen in the background. The title of the film is seen in interesting 3D typography at the bottom of this reissue Bollywood poster. 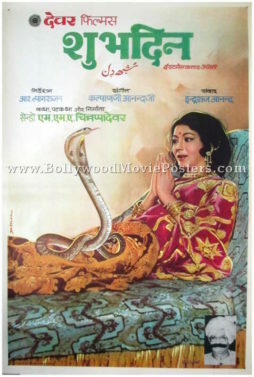 Vintage Bollywood poster for sale of the old Indian snake movie Shubh Din (1974). This is an actual surviving vintage Bollywood poster for sale of the 1974 old Hindi movie that starred Shashi Kiran in the lead role. Printed and circulated during the original first release of the film (somewhere in the early 1970s), this vintage Bollywood poster was printed for publicity of the film but never ended up being used. This vintage Bollywood poster was originally designed using a combination of both hand painted as well as photographic techniques. Set against a light gradient background hand painted with broad visible brush strokes, this Bollywood poster features a woman lying on a bed folding her hands in front of a snake. A small black and white photographic still of a man with a mustache is seen on the bottom right hand corner of this vintage Bollywood poster. 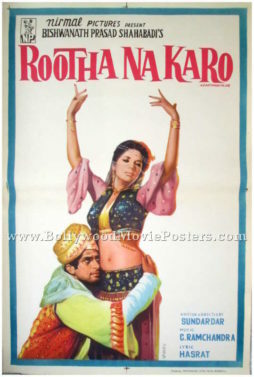 Vintage Bollywood poster for sale of the old Hindi film Rootha Na Karo (1970). This is an actual surviving old Bollywood poster for sale of the 1970 Hindi film that starred Shashi Kapoor and Nanda in lead roles. Printed and circulated during the original first release of the film (somewhere in 1970), this vintage Bollywood poster was printed for publicity of the film but never ended up being used. Rootha Na Karo was a romantic thriller that featured the most handsome actor in Bollywood, Shashi Kapoor as the lead protagonist. This old Bollywood poster was originally designed in hand painted oil on canvas format by one of the most sought after Bollywood poster artists of his time, C. Mohan, making it highly collectible. Bollywood poster artist C. Mohan’s signature style of using minimalist design techniques coupled with stunningly realistic hand painted portraits of the actors is seen in this vintage Bollywood poster. Set against a plain white background, the poster creates an immediate visual impact owing largely to its minimalist design. Artist C. Mohan’s original signature appears on the bottom right of the poster. 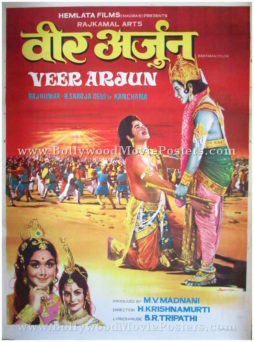 Bollywood poster for sale of the old Indian mythology movie Veer Arjun (1977). This is an actual surviving original Bollywood poster of the 1977 Hindi film that was based on the legendary story of Prince Arjuna from the ancient Indian epic of the Mahabharata. 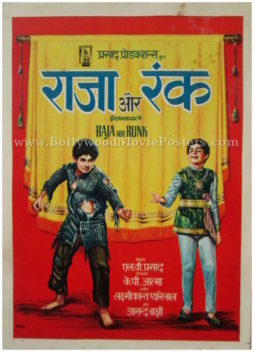 Printed and circulated during the first release of the film (somewhere in the late 1970s), this old Bollywood poster was printed for publicity of the film but never ended up being used. This old Indian mythology poster features an interesting combination technique in the design of its artwork. Still photographs have been over painted with deep colors, giving this old Bollywood poster a vivid appearance. In this Bollywood poster, Arjuna is seen taking the blessings of Lord Shree Krishna while a battle ensues in the background. 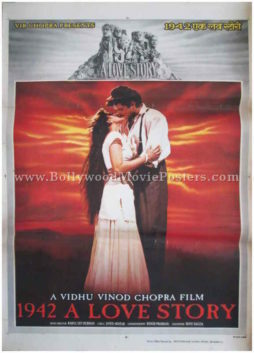 Bollywood poster for sale of the highly acclaimed Hindi film, 1942: A Love Story (1994). This is an actual surviving old Hindi movie poster of the 1994 film directed by Vidhu Vinod Chopra starring Anil Kapoor, Manisha Koirala, Jackie Shroff, Anupam Kher, Danny Denzongpa and Pran in pivotal roles. Printed and circulated during the initial first release of the film (early 1990s), this old Hindi film poster was originally designed for publicity of the film but never ended up being used. This old Hindi film poster features a stunning image of actor Jackie Shroff engaged in battle. 1942: A Love Story is a landmark film in Indian cinema, making this old Hindi movie poster highly collectible! The period film was set in the year 1942, at a time when India was under British rule. The award winning, timeless music of the film was composed by one of the greatest music directors in the history of Indian cinema, Rahul Dev Burman (RD Burman aka Pancham Da). 1942: A Love Story was released after the demise of master music composer RD Burman. He was awarded posthumously for his brilliant compositions in the film, winning his third and last Filmfare Award. The film was the first Bollywood movie to use Dolby Sound and became a milestone in sound engineering, paving the way for use of the format in subsequent films. The film’s highly acclaimed music composed by music director R.D. Burman with lyrics by Javed Akhtar bagged several Filmfare Awards. Songs from the film, most notably “Ek Ladki Ko Dekha Toh” and “Kuch Na Kaho” are fondly remembered and played till today. 1942: A Love Story was one of the first Bollywood films to be given a U/A rating as it featured a kissing scene, which was deemed by the censor board as inappropriate for young children. Original Bollywood poster of the highly acclaimed Hindi film, 1942: A Love Story (1994) for sale. This is an actual surviving old Bollywood poster of the 1994 movie directed by Vidhu Vinod Chopra starring Anil Kapoor, Manisha Koirala, Jackie Shroff, Anupam Kher, Danny Denzongpa and Pran in pivotal roles. Printed and circulated during the initial first release of the film (early 1990s), this Bollywood film poster was originally designed for publicity of the film but never ended up being used. This old Bollywood poster features a stunning image of the lead couple Anil Kapoor and Manisha Koirala in a passionate embrace. 1942: A Love Story was one of the first Bollywood films to be given a U/A rating as it featured a kissing scene, which was deemed by the censor board as inappropriate for young children. It is this very kissing scene featuring Anil Kapoor and Manisha Koirala that is depicted in a large photographic still in this old Bollywood poster. 1942: A Love Story is a landmark film in Indian cinema, making this Bollywood poster highly collectible! Bollywood poster of the cult Hindi film, Lagaan (2001) for sale. 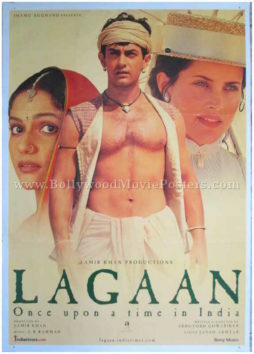 This is an actual surviving original Bollywood poster of the blockbuster 2001 period film written and directed by Ashutosh Gowariker that starred Aamir Khan, Gracy Singh and British actors Rachel Shelley and Paul Blackthorne in lead roles. An Indian epic sports-drama, Lagaan became the third Indian film to be nominated for the Academy Award for Best Foreign Language Film after Mother India (1957) and Salaam Bombay! (1988), making this Bollywood movie poster highly collectible! Printed and circulated somewhere during the original first release run of the film in 2001, this Bollywood poster was printed for publicity of the film but never ended up being used. Superstar Aamir Khan is seen prominently at the center of this glossy Lagaan poster. He is flanked by Gracy Singh on one side and British actress Rachel Shelley on the other. The subtitle of the film is seen at the bottom of this Bollywood movie poster with the words, “Once upon a time in India,” giving away the period setting of the film. The highly acclaimed soundtrack of Lagaan was composed by A.R. Rahman with lyrics by Javed Akhtar. Held as one of A.R. Rahman's finest compositions, the soundtrack became a rage throughout the nation upon its release. Songs like “Mitwa” and “Chale Chalo” are fondly remembered and played till today. 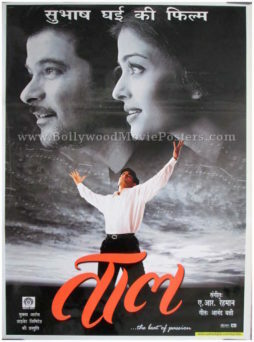 Old Bollywood poster of the blockbuster Hindi film, Taal (1999) for sale. This is an actual surviving Bollywood movie poster of the 1999 musical romance that starred Anil Kapoor (of Slumdog Millionaire fame), Akshaye Khanna and Aishwarya Rai in lead roles. Taal was the highest grossing film of the year in overseas markets – becoming a massive success in both the US and UK. It became the first Indian film to reach the top 20 on Variety’s box office list, making this Taal movie poster highly collectible! Taal won several Filmfare awards – most notably the Best Music Director Award for AR Rahman’s brilliant compositions in the film. Songs from the film became a rage throughout the nation at the time of the film’s release. The soundtrack of the film made it to the “Greatest Bollywood Soundtracks of All Time” list. Tracks like “Taal Se Taal Mila” and “Ramta Jogi” are counted as AR Rahman’s finest and played till today. 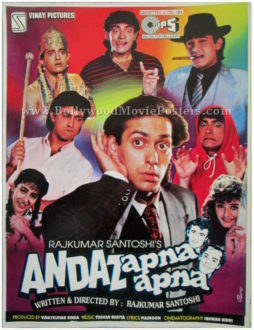 Printed and circulated during the initial release run of the film somewhere in the late 1990s, this old Bollywood poster was printed for publicity of the film but never ended up being used. Large photographic close ups of Anil Kapoor and Aishwarya Rai are seen on the top in this old Bollywood poster in black and white. Akshaye Khanna is seen in a smaller still colored photograph at the bottom of this glossy Bollywood movie poster. The title of the film appears in striking typography in Devanagari Hindi font at the bottom. This Bollywood film poster appears predominantly in black and white (except for the title and the colored photograph at the bottom). Vintage Bollywood poster for sale of one of the greatest Bollywood movies ever made in Indian cinema, Deewaar (1975). This is an actual surviving original poster of the 1975 action Hindi film Deewaar that featured the biggest superstar of Indian cinema, Amitabh Bachchan in the lead role. Deewaar (sometimes also spelled as Deewar) is considered one of the most iconic movies ever made in Indian cinema and finds mention among the cult films of Bollywood, making this rare two sheet Deewaar original poster highly collectible! Printed and circulated a few years after the first release of Deewaar (somewhere in the 1980s), this Deewaar old movie poster was intended for publicity of the film’s local release run in Delhi but never ended up being used. This fabulous two sheet Bollywood poster measures a stunning 80″x30″ inches (approximately) in size when its two individual sheets are joined or pasted together. The poster comprises two separate single sheets, each measuring 40″x30″ inches. When pasted together, the two sheets line up perfectly and together form one single movie poster. This Deewaar Amitabh poster was originally designed by a small time art studio in Delhi giving it a very quirky appearance. The angry young man of Bollywood is seen in his legendary pose in this Deewaar old movie poster. Dressed as a porter, he is seen wearing the iconic lucky badge on his shoulder (bearing the serial no. 786) in this old Amitabh movie poster. Actor Shashi Kapoor is seen taking aim in a smaller hand painted rendition on the top right hand corner of this Deewaar poster. Villain Madan Puri and actress Parveen Babi are seen in quirky hand drawn renditions at the bottom of this Amitabh Bachchan movie poster. Nirupa Roy is also seen in a photographic still in this Deewaar original poster. Deewaar (The Wall), is a cult 1975 Hindi film directed by Yash Chopra and written by Salim-Javed. Starring the greatest superstar of Indian cinema Amitabh Bachchan, Deewaar tells the story of two impoverished brothers (played by Amitabh Bachchan and Shashi Kapoor) who struggle to survive on the indifferent streets of Mumbai after the passing away of their father. One of them, Shashi Kapoor chooses the path of good, becoming a police officer. Amitabh on the other hand turns into a mafia don and amasses quick wealth and success. This creates an obvious divide or enmity between them, inspiring the title of the film. Deewaar is believed to be based loosely on the real life of one of Mumbai’s iconic gangsters, Haji Mastan. For preparation of his character as a gangster in the film, it is further believed that Amitabh Bachchan met Haji Mastan in person to study his mannerisms. Deewaar is widely credited for establishing Amitabh Bachchan as the “angry young man” of Bollywood. Actress Parveen Babi was seen as the new age woman in Indian cinema, whose character appears as a liberated woman smoking and drinking, living-in with her lover – defying all traditional norms of the time. The brilliant storyline and dialogues of the film established Salim-Javed as the most sought after writers in Indian cinema. It is believed they were paid as high as actors in subsequent films they worked on, thanks to the success of Deewaar. Deewaar bagged numerous awards, and is credited as a must see film in Indian cinema. The music of the film was composed by RD Burman. The track “Keh Doon Tumhe” was a chartbuster. 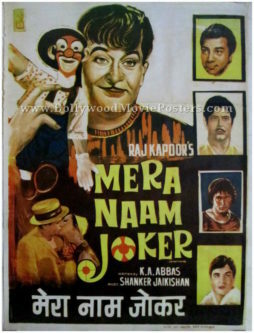 One of the dialogues from the film, “Mere Paas Maa Hai” is regarded as one of the greatest dialogues ever in Indian cinema and has inspired countless spoofs over the years. Danny Boyle, who described Deewaar as being “absolutely key to Indian cinema”, cited the film as an influence on his Academy Award winning Slumdog Millionaire (2008). Vintage Bollywood poster for sale of the hit Hindi film Dream Girl (1977). This is an actual surviving publicity poster of the 1977 film directed by Pramod Chakravorty that starred the Dream Girl of Indian cinema Hema Malini in the pivotal role. Ashok Kumar, Dharmendra and Prem Chopra also starred in the film. Hema Malini earned the moniker of Dream Girl during her debut in 1968, which eventually inspired the title of the film. Printed and circulated subsequent to the first release of the film (somewhere in the 1980s), this vintage Bollywood poster was originally designed for publicity of the film for a local release run in Delhi but never ended up being used. This hand drawn Bollywood poster features a stunning rendition of the Dream Girl of Bollywood, Hema Malini in a dancing pose. The poster is set against a light blue background. A large close up portrait of actor Dharmendra is seen in the background of this Dream Girl movie poster. The quirky manner in which the faces of the stars have been painted is typical of old vintage Bollywood posters in Delhi. The soundtrack of the film was composed by music composer duo Laxmikant-Pyarelal. The title song of the film, “Dream Girl” sung by Kishore Kumar is fondly remembered and played till today. 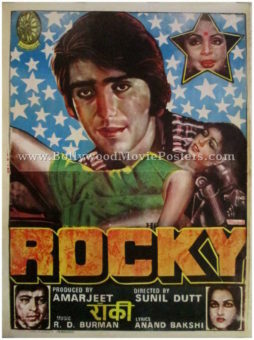 Old Bollywood poster for sale of the hit Hindi film Rocky (1981). This is an actual surviving publicity poster of the 1981 film that marked the Bollywood debut of Sunil Dutt’s son, Sanjay Dutt. Rocky was produced and directed by actor Sunil Dutt, who also played a cameo role in the film. Tina Munim Ambani played Sanjay Dutt’s love interest in Rocky, while Reena Roy, Amjad Khan, Raakhee and Shakti Kapoor played supporting characters. Printed and circulated subsequent to the first release of the film (somewhere in the late 1980s), this old Hindi movie poster was originally designed for publicity of the film for a local release run in Delhi but never ended up being used. This quirky hand drawn Bollywood poster features a large artistic rendition of actor Sanjay Dutt (who plays the pivotal role of Rocky in the film) on the top. The poster is set against a starry blue background. Tina Munim Ambani is seen lying down on a motorbike below. Smaller images of supporting actors Reena Roy, Amjad Khan and Raakhee are also seen on this Rocky Bollywood poster. Delhi Bollywood poster painter Ranjeet’s signature is seen on the right hand corner of this Rocky Sanjay Dutt poster. The quirky manner in which the faces of the stars have been painted is typical of hand drawn Bollywood posters in Delhi. Rocky was released only four days after the death of Sunil Dutt’s wife and Sanjay Dutt’s mother, Nargis. A seat was left vacant at the premiere of the film as a befitting tribute to her. The soundtrack of the film was composed by R D Burman and became a rage throughout the nation at the time of its release. Songs like “Doston Ko Salam,” “Aa Dekhen Zara” and “Kya Yehi Pyar Hai” are fondly remembered and played till today. Old Bollywood poster of the hit Hema Malini film, Seeta aur Geeta (1972) for sale. This is an actual surviving publicity poster of the 1972 film that featured the Dream Girl of Indian cinema, Hema Malini in an unforgettable double role. Dharmendra and Sanjeev Kumar also starred in this 1972 Bollywood comedy that was directed by Ramesh Sippy. The film’s success made the phrase “Seeta Aur Geeta” a moniker of sorts to refer to sisters in India. Hema Malini won the Filmfare Best Actress Award for Seeta aur Geeta, making this vintage Bollywood poster highly collectible. Printed and circulated subsequent to the first release of the film (somewhere in the late 1970s), this old Hindi movie poster was originally designed for publicity of the film for a local release run in Delhi but never ended up being used. This quirky hand drawn Bollywood poster features a large closeup of Dharmendra holding a pistol in his hand. Dream Girl Hema Malini appears twice in this vintage Bollywood poster in two different avatars to depict the double role plot of the film. Actor Sanjeev Kumar is seen in a smaller rendition at the bottom of this Seeta Aur Geeta poster. Delhi Bollywood poster painter Amar’s signature is seen on the right hand corner of this vintage Bollywood poster. The action sequences captured in smaller stick figures in the background and the pistol wielding actors in the foreground are typical of hand drawn Bollywood posters in Delhi. Seeta aur Geeta tells the story of identical twins separated at birth. The film was written by Salim-Javed and it’s music composed by R.D. Burman. Seeta aur Geeta is one among several Bollywood films that feature a similar plot surrounding the reunion of long lost identical twins. Most notable among these was Ram Aur Shyam starring Dilip Kumar in a double role. Vintage original Charlie Chaplin movie poster of the cult classic, The Chaplin Revue (1959) for sale. 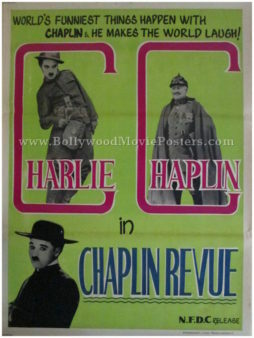 This is an actual surviving poster of the 1959 classic, The Chaplin Revue, which was released in India by the National Film Development Corporation of India (NFDC). The Chaplin Revue is a 1959 film comprising three silent films made by Charlie Chaplin, namely A Dog’s Life, Shoulder Arms and The Pilgrim, with all three films starring Chaplin’s iconic character, The Tramp. After his last three films, namely Monsieur Verdoux, Limelight and A King in New York failed to attain universal acclaim, Charlie Chaplin’s star power was fading. The Chaplin Revue was an effort to revive his role as The Tramp for modern audiences. The Chaplin Revue was critically acclaimed when released in 1959, making this original Charlie Chaplin movie poster highly collectible. Designed, printed and circulated in India somewhere in the 1970s/1980s during the film’s release in India, this Charlie Chaplin movie poster was originally intended for publicity but never ended up being used. The letter C is capitalized in a large stylized font and makes for an interesting design when juxtaposed with still photographs within. Reissue movie poster of the epic Hindi film Sholay (1975) for sale. 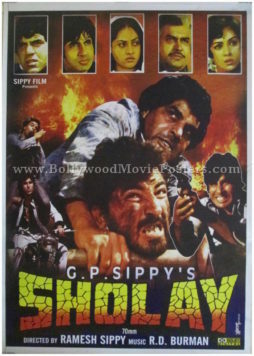 Featured here for sale is a Sholay Hindi movie poster circulated during a very recent screening of the greatest film ever made in Indian cinema. Printed and circulated very recently, this Sholay Hindi movie poster was originally designed for publicity of a recent re-release of the film but never ended up being used. Sholay has an unbeaten record for running for over five consecutive years after being released. The film enjoys a cult following in India and its dialogues are often quoted in various media. It is widely believed that Sholay is the highest grossing Indian film of all time when adjusted for inflation, making this Sholay Hindi movie poster highly collectible! The greatest villain of all time Amjad Khan who plays the iconic character of Gabbar Singh is seen prominently in this Sholay Hindi movie poster at the center. He is flanked by superstar Amitabh Bachchan and Dharmendra who are both seen holding guns. A smaller still photograph of actor Sanjeev Kumar is seen on the top of this Sholay Hindi movie poster. Featured here for sale is a Sholay original movie poster circulated during a very recent screening of the greatest film ever made in Indian cinema. Printed and circulated very recently, this Sholay Hindi movie poster was originally designed for publicity of a recent re-release of the film but never ended up being used. The greatest villain of all time Amjad Khan who plays the iconic character of Gabbar Singh is seen prominently in this Sholay movie poster along with Dharmendra at the center. The photographic still is taken from the climax of the film. 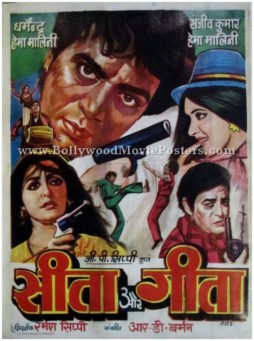 A solo still photograph of superstar Amitabh Bachchan holding a gun is seen alongside in this Sholay original movie poster. A still photograph from the iconic song “Yeh Dosti” is seen at the corner of the poster. Smaller pictures of Dharmendra, Amitabh Bachchan, Jaya Bhaduri Bachchan, Sanjeev Kumar and Hema Malini are seen on the top of this Sholay poster. Classic Bollywood film poster of the blockbuster Hindi movie Kuch Kuch Hota Hai (1998) for sale. This is an actual surviving Shahrukh Khan poster of the 1998 Hindi film KKHH that featured the “King of Bollywood” in the lead role opposite actress Kajol. Rani Mukerji and superstar Salman Khan also starred in the film. Kuch Kuch Hota Hai (KKHH) starred the popular on-screen pair of Shah Rukh Khan & Kajol and marked the directorial debut of Karan Johar. The film was extremely successful in India and abroad, becoming the highest grossing Indian film of the year and the third highest grossing Indian film ever behind Hum Aapke Hain Koun..! and Dilwale Dulhania Le Jayenge. Kuch Kuch Hota Hai was the first Bollywood film to enter the UK cinema top ten and was the highest grossing Indian film ever outside of India, until its record was broken by Karan Johar's next directorial, Kabhi Khushi Kabhie Gham (2001). Kuch Kuch Hota Hai swept all major categories at the 1999 Filmfare Awards, becoming the third Indian film to win all four major awards (Best Film, Best Director, Best Actor and Best Actress) at Filmfare, making this Kuch Kuch Hota Hai movie poster, highly collectible! Printed and circulated somewhere in late 1990s, this glossy Kuch Kuch Hota Hai movie poster was originally designed for publicity of the film but never ended up being used. A stunning close up of Kajol is seen on the left hand side of this KKHH poster. Shah Rukh Khan is seen in a dancing pose alongside. The soundtrack of the film became a rage throughout the nation. Songs like “Kuch Kuch Hota Hai” and “Koi Mil Gaya” are played till today. Classic Bollywood poster of the blockbuster Hindi movie Mohabbatein (2000) for sale. This is an actual surviving classic Bollywood poster of the 2000 Hindi film written and directed by Aditya Chopra that featured the “King of Bollywood,” superstar Shahrukh Khan in the lead role. The greatest actor in Indian cinema, superstar Amitabh Bachchan played a supporting role in the film. Mohabbatein is the first film to feature superstars Shahrukh Khan and Amitabh Bachchan together, making this Mohabbatein Hindi movie poster highly collectible! Printed and circulated during the original first release of the film somewhere in 2000, this Mohabbatein movie poster was originally designed for publicity of the film but never ended up being used. Produced by Yash Chopra, Mohabbatein was Aditya Chopra's second directorial venture after Dilwale Dulhania Le Jayenge. Filmed partly in the UK, Mohabbatein also starred six young debutantes Uday Chopra, Jugal Hansraj, Jimmy Shergill, Shamita Shetty, Kim Sharma and Preeti Jhangiani. Aishwarya Rai also made a special appearance in the film. The soundtrack of Mohabbatein was composed by Jatin-Lalit, while the lyrics were penned by Anand Bakshi. Songs like “Humko Humise Chura Lo,” “Chalte Chalte Yunhi Ruk Jaata Hoon Main” and “Aankhein Khuli Ho Ya Ho Band” are fondly remembered and played till today. Classic Bollywood movie poster of the blockbuster Hindi film Kuch Kuch Hota Hai (1998) for sale. This is an actual surviving Shahrukh Khan poster of the 1998 Hindi movie KKHH that featured the “King of Bollywood” in the lead role opposite actress Kajol. Rani Mukerji and superstar Salman Khan also starred in the film. Kuch Kuch Hota Hai was the first Bollywood film to enter the UK cinema top ten and was the highest grossing Indian film ever outside of India, until its record was broken by Karan Johar’s next directorial, Kabhi Khushi Kabhie Gham (2001). Kuch Kuch Hota Hai swept all major categories at the 1999 Filmfare Awards, becoming the third Indian film to win all four major awards (Best Film, Best Director, Best Actor and Best Actress) at Filmfare, making this Kuch Kuch Hota Hai poster, highly collectible! 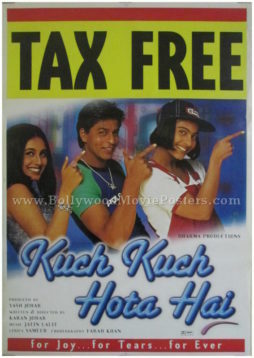 In 1999, a year after the film’s release, Kuch Kuch Hota Hai was granted a tax free status by the government (subsequent to the film being conferred the National Film Award). Printed and circulated somewhere in late 1999, this glossy Kuch Kuch Hota Hai poster was originally designed for publicity of the tax free release of the film but never ended up being used. Shah Rukh Khan, Kajol and Rani Mukerji are seen in a dancing pose together in this KKHH poster. The tax free status of the film is advertised prominently in a yellow strip on the top of this Shahrukh Khan poster. 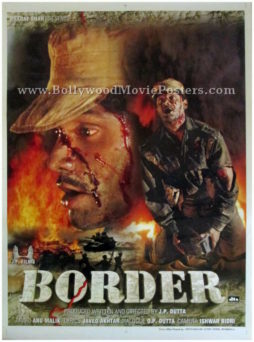 Classic Bollywood movie poster of the blockbuster Hindi film, Border (1997) for sale. 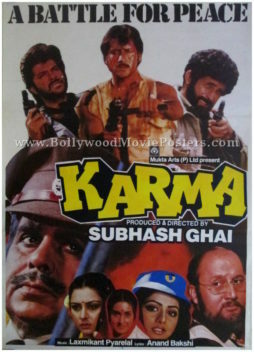 This is an actual surviving classic Bollywood poster of the 1997 Hindi film produced, written and directed by JP Dutta that starred an ensemble cast comprising Sunny Deol, Suniel Shetty, Akshaye Khanna, Jackie Shroff, Sudesh Berry, Kulbhushan Kharbanda, Puneet Issar, Raakhee, Tabu and Pooja Bhatt. The film won numerous awards, chief among them being the Nargis Dutt Award for Best Feature Film on National Integration, the Filmfare Award for Best Director and the Star Screen Award for Best Film. Border went on to become one of the finest patriotic films ever made in Indian cinema, making this Sunil Shetty movie poster highly collectible! Printed and circulated during the original first release of the film (somewhere in 1997), this Border movie poster was originally designed for publicity of the film but never ended up being used. Suniel Shetty, who essayed the role of Border Security Force Captain Bhairon Singh in the film, is seen in a large close up in this Border movie poster. A smaller still photograph in which he is seen carrying an anti tank mine appears at the bottom of this Border Hindi movie poster. The typography used in this poster is entirely in English. A faintly recognizable map is seen in the background of this Border film poster. Border is a 1997 blockbuster Hindi film based on the Indo-Pak war of 1971, called the “Battle of Longewala”. The film featured unforgettable music and one of its songs, “Sandese Aate Hain” became the country’s anthem upon its release. Lyricist Javed Akhtar bagged numerous awards for the song and it continues to be played till today. Border went on to become one of the finest patriotic films ever made in Indian cinema, making this Sunny Deol movie poster highly collectible! 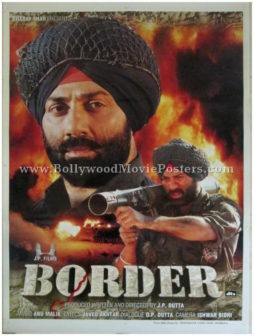 Sunny Deol, who essayed the role of real life war hero Major Kuldip Singh in the film, is seen in a large close up in this Border movie poster. 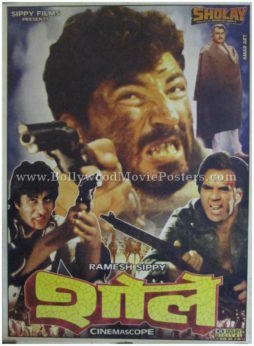 A smaller still photograph in which he is seen firing a grenade launcher appears at the bottom of this Border Hindi movie poster. The typography used in this poster is entirely in English. A faintly recognizable map is seen in the background of this Border film poster. 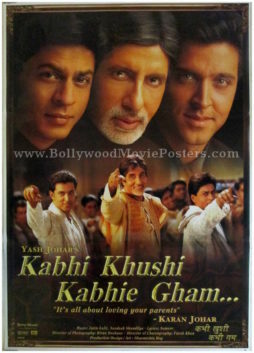 Classic Bollywood poster of the blockbuster film Kabhi Khushi Kabhie Gham (2001) for sale. This is an actual surviving classic Bollywood poster of the 2001 Hindi movie written and directed by Karan Johar that featured the “King of Bollywood,” superstar Shahrukh Khan in the lead role opposite actress Kajol. The film also starred the greatest actor in Indian cinema, superstar Amitabh Bachchan along with Jaya Bhaduri Bachchan, Hrithik Roshan and Kareena Kapoor in prominent roles. Kabhi Khushi Kabhie Gham (sometimes also abbreviated as KKKG or K3G) holds the distinction of being the first Indian film to be given a theatrical release in Germany. The film was a massive success at the box office, breaking all opening records upon its release. K3G bagged five Filmfare Awards and is counted as one of the highest grossing Indian films in the overseas market, making this Kabhi Khushi Kabhie Gham movie poster, highly collectible! Printed and circulated during the original first release of the film somewhere in 2001, this Kabhi Khushi Kabhie Gham poster was originally designed for publicity of the film but never ended up being used. The soundtrack of the film became a rage throughout the nation upon its release. Songs like “Kabhi Khushi Kabhie Gham,” “Bole Chudiyan,” “You Are My Soniya” and “Say Shava Shava” are played till today. Hand drawn artwork Bollywood poster of the old Hindi film, Raja Aur Runk (1968) for sale. This is an actual surviving publicity poster of the 1968 film that featured Sanjeev Kumar and Kumkum in lead roles. Printed and circulated during the original first release run of the film (somewhere in the late 1960s), this vintage Bollywood poster was printed for publicity of the film but never ended up being used. Raja Aur Runk featured the hit Mohammed Rafi song, “O Phirki Wali,” which is fondly remembered till today. This poster was originally designed in hand painted oil on canvas format by a leading art studio in Bombay, making it highly collectible. The design of this hand drawn Bollywood poster captures the stark contrast between rich and poor by featuring the prince and the pauper alongside in their element. The printed signature of talented Bollywood poster painter Vishnu is seen at the bottom left of this hand drawn Bollywood poster. Raja Aur Runk is a 1968 Bollywood movie starring Sanjeev Kumar and Kumkum in lead roles. The film is an adaptation of Mark Twain’s novel, The Prince and the Pauper. It revolves around the contrasting lives of two identical twins born to separate families – one rich and the other poor. Original six sheet Bollywood poster of the epic Hindi film Sholay (1975) for sale. Featured here for sale is an original Sholay poster circulated during the film’s 30th anniversary release run in 2004. On August 13, 2004, an enhanced version of Sholay was released to coincide with its 30th anniversary in the coming year. This is an original six sheet Bollywood movie poster printed and circulated during the enhanced re-release of Sholay – the greatest film ever made in Indian cinema. Printed and circulated in 2004, this Sholay poster was originally designed for publicity of the 30th anniversary re-release of the film but never ended up being used. Sholay is considered the greatest film ever made in Indian cinema, making this Sholay original poster highly collectible! This fabulous six sheet poster measures a stunning 120″x60″ inches (approx) in size when its six individual sheets are joined or pasted together. The poster comprises six separate single sheets, each measuring 40″x30″ inches. When pasted together they line up perfectly and together form one single six sheet poster. As shown in the photographs, there may be a slight gap visible between the six sheets – as the images have been photographed individually and then joined together digitally. When framed or pasted, there will be no gap visible between the six sheets and the appearance of the poster would be seamless – i.e. just like a single sheet poster. This Sholay film poster announces the enhancement of the film’s audio visuals at the top: “First Time In Cinemascope 4 Track Optical Sound.” The title of the film is seen painted prominently in an iconic 3D styled font on this Sholay backdrop sized poster. Still pictures of the film’s six lead characters are seen prominently in this Sholay movie poster. The greatest villain of all time Amjad Khan who plays the iconic character of Gabbar is seen twice in this Sholay Gabbar Singh poster. Sholay is the highest grossing film of all time in Indian cinema and unanimously regarded as the greatest film ever made in Bollywood. Declared as the “Film of the Millennium” by BBC India in 1999, Sholay is an unforgettable classic that has become almost synonymous with ‘masala’ in Indian cinema. Its characters such as Jai, Veeru, Basanti, Thakur & Gabbar Singh have been etched into history. The film has an unbeaten record for running for over five consecutive years after being released. Sholay enjoys a cult following in India and its dialogues are often quoted in various media. 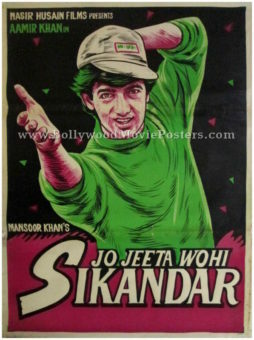 Original Bollywood poster for sale of the blockbuster Hindi film Jo Jeeta Wohi Sikandar (1992). This is an actual surviving original Bollywood poster of the 1992 sports drama directed by Mansoor Khan that starred Aamir Khan, Ayesha Jhulka, Deepak Tijori, Pooja Bedi, Mamik Singh and Kulbhushan Kharbanda in pivotal roles. Printed and circulated a few years after the initial first release of the film (somewhere in the 1990s), this Jo Jeeta Wohi Sikandar movie poster was originally designed for publicity of the film but never ended up being used. Jo Jeeta Wohi Sikandar won the Filmfare award for best movie besides receiving several other nominations, making this old Bollywood poster highly collectible! This Jo Jeeta Wohi Sikandar poster was designed by an art studio in Kolkata and has a quirky hand painted appearance which is typical of old school Bollywood film poster art. A stunning hand drawn portrait of superstar Aamir Khan is seen prominently in this hand painted Bollywood poster. The title of the film appears in a very stylized font at the bottom. Produced by Nasir Hussain, Jo Jeeta Wohi Sikandar inspired several remakes such as the 1999 Telugu film Thammudu, the 2001 Tamil film Badri, the 2001 Kannada film Yuvaraja and the 2003 Bengali film Champion. The soundtrack of the film was composed by Jatin Lalit and lyrics were penned by Majrooh Sultanpuri. Upon its release, the album became a rage throughout the nation. Songs like “Pehla Nasha” and “Yahaan Ke Hum Sikander” sung by Udit Narayan are fondly remembered and played till today. “Pehla Nasha” has become a timeless classic and often finds mention in the greatest Bollywood film tracks of all time. Vintage Bollywood poster for sale of the blockbuster Hindi film, Junglee (1961). This is an actual surviving original vintage Bollywood poster of the 1961 Hindi film that featured the “Elvis Presley of India,” Shammi Kapoor in the lead role opposite actress Saira Banu. Junglee marked the debut of actress Saira Banu’s career and earned her a Filmfare Award nomination for Best Actress. The film featured chartbusters such as “Aai Aai Ya Sukoo Sukoo” and “Yahoo! Chahe Koi Mujhe Junglee Kahen” sung by Mohammed Rafi, making this Junglee movie poster highly collectible! Printed and circulated a few years after the first release run of the film (late 1960s / early 1970s), this Junglee movie poster was originally designed for publicity of a subsequent release of the film but never ended up being used. This vintage Bollywood poster was originally designed on canvas by a poster design studio in Delhi. The poster features a stunning rendition of Shammi Kapoor in his iconic “freestyle” dancing pose on the top. The opening lyric of the cult song, “Yahoo!” appears written in bold prominently on the top along with the message “Junglee is back,” signifying the re-release of the film. 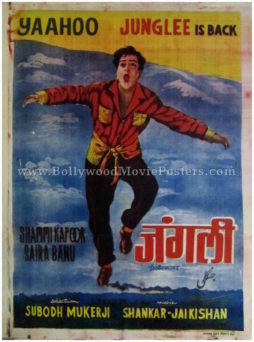 A snowy background is seen behind Shammi Kapoor in this Junglee movie poster. The soundtrack of Junglee is fondly remembered and played even today. Songs like “Ehsaan Tera Hoga,” “Aai Aai Ya Sukoo Sukoo” and “Yahoo! Chahe Koi Mujhe Junglee Kahen” have become timeless classics.